The beautiful Marokopa Falls is a waterfall situated near the village of Waitomo in the Waikato Region on the North Island of New Zealand. The Marokopa River plunges 35 metres over a greywacke escarpment creating what we know as the Marokopa Falls, one of the most beautiful waterfalls in New Zealand. The waterfall is situated in the vicinity of Waitomo in the Waikato region of the North Island of New Zealand. Marokopa Falls, Waikato, North Island, New Zealand. Marokapa Falls Scenic Reserve. 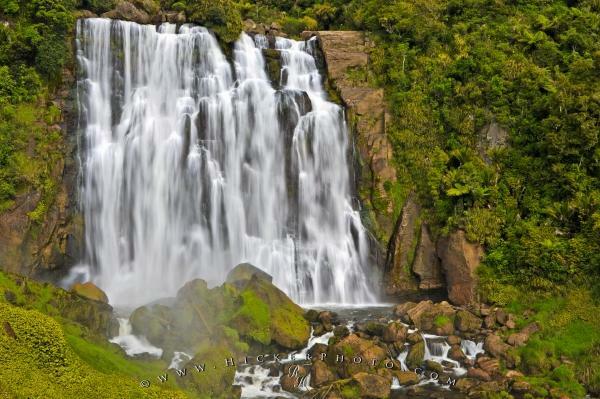 Photo of the Marokopa Falls waterfall in the Waikato region of New Zealand. Pictures from photo gallery "Waikato"
This picture is part of the photo album "Waikato" - there are more beautiful images waiting for you.